In her second novel, Chloe Benjamin weaves an ambitious family saga that spans several decades. The premise is intriguing: How would you live your life if you knew the day you were going to die? This is the problem troubling the four Gold children, after a mysterious gypsy reads their fortunes in a sweltering New York apartment in 1969. Each child interprets the information differently, and the novel is broken into four short stories focusing on each in turn. We meet Simon, a young gay man who escapes to San Francisco (the scenes that handle the start of the AIDS epidemic in the Eighties are some of the book’s most powerful); Klara, a wannabe magician in Vegas; military doctor Daniel; and Varya, who is working on an anti-ageing study. In its scope and themes, The Immortalists brings to mind Hanya Yanagihara’s A Little Life. 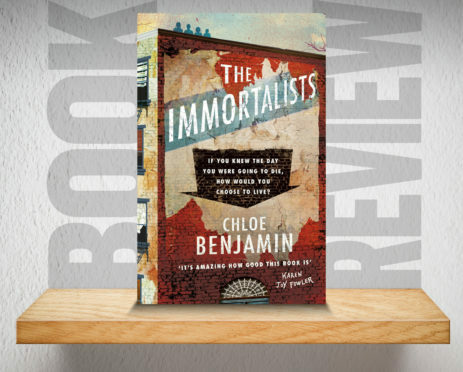 The problem is, while that book had flawed yet lovable characters, The Immortalists tends to focus on the flaws, and it’s hard to always root for the siblings. While Simon and Varya’s stories ring true, the actions of Klara and Daniel are frustrating. Benjamin also seems to be ticking off a list of issues – mental health, homosexuality, animal cruelty, religion etc. – that can distract from the story. The most interesting characters are often those shunted to the edges: matriarch Gertie, football star-turned ballet dancer Robert, and precocious child Ruby. A strong ending is almost redemptive, but although you’re seemingly supposed to take away a lesson on how to live fully, it’s hard not to finish the book hoping you’re never given advance warning of your death.